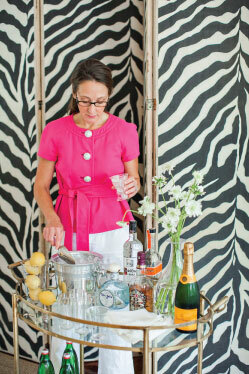 Seasoned hostesses keep the bar stocked and ready for unexpected company. In addition to scotch, vodka and bourbon, I like to have beer, wine and champagne on hand. are my favorite – the packaging is nice enough to display, and boy do they taste good! 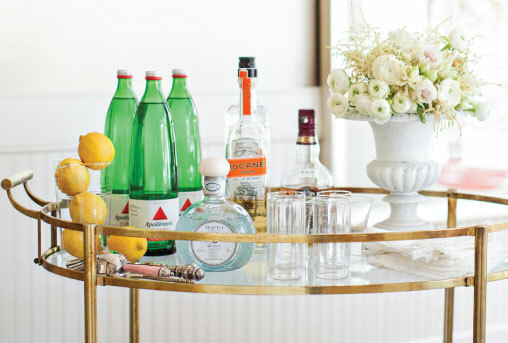 Bar carts are certainly fun for serving drinks, but if your space is limited, set up the bar on an existing countertop or table. I dress up my kitchen counter with a special tray (rattan, lacquer, silver, brass, etc. ), add pretty napkins and a chic horn bowl for nuts. 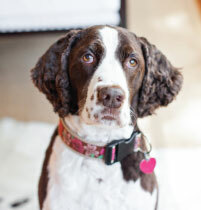 When serving wine for cocktails, I prefer to use the Riedel stemless wine glasses – they’re childproof (and dog proof!) – which is essential in my house! Juice glasses also work for wine in a casual setting. Charleston mixologist, Brooks Reitz, is the talk of the town with his specialty mixer, Jack Rudy Cocktail Co. Small Batch Tonic. His site features some great recipes along with retail outlets. The bottle is to die for! replacing liquor bottles with decanters. makes great looking decanters in handblown glass. Keep a variety of pitchers on hand for the bar – from water to flowers, they come in handy.